Means of contact: 240-475-0061, PM or this thread. 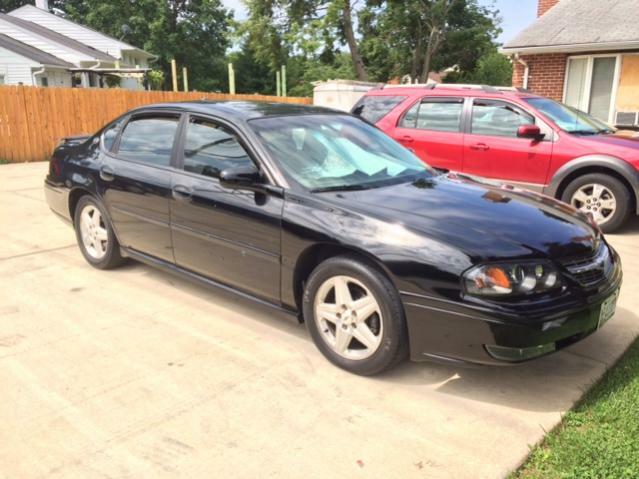 Description: I am selling my 2004 Chevrolet Impala SS. It is my first car and I hate to part ways with it but I need something more roomy for the family. I acquired the vehicle in 2011 from a cousin of mine. The car had been left for dead and hadn't been run in quite some time. We decided it was best to rebuild the motor, piece by piece, hose by hose. The block and heads were taken to Tacho's Machine Shop in Brentwood, MD and refurbished and re-polished. Parts were acquired and by 2012, the car was up and running. Since then, the car has had very minor issues all of which I have fixed myself. As of recent, I have added a brand new rack and pinion and brand new front left and right axles to the car. The car gets regular tune ups and oil changes. However, the car does have a faulty coil (2nd one I believe) which causes a cylinder misfire and is the reason for the check engine light to blink. The parking brake light is on but I do have the switch which was purchased from Chevrolet. I no longer have the time to fix these minor issues myself and will sell the vehicle as is. Mileage: 177,000 on body 20,000 on motor. Exterior: Perfect other than scratch on rear bumper and tear on front bumper. Services: All services done personally by myself or Tacho from Tacho's Machine Shop. Have all receipts. Pictures: Please PM me for more detailed picture. Last edited by Ifidel; 07-11-2014 at 06:14 PM.